The very trademark of Disney itself, Mickey Mouse personifies the company's library of cartoon characters. How ironic then, that over the years Mickey himself has at times teetered on the brink of falling into the “Wasteland” of seemingly forgotten Disney characters no longer in use. In an effort to restore Mickey to his rightful status as leading man, as well as breathe new life into its vast library of cartoon characters that haven't seen the light of day in decades, Disney set itself to the epic task of creating a single game that would make all of these characters relevant to modern audiences. To that end, Disney enlisted industry respected game designer Warren Specter to steer the project. Known for his games that emphasise player choice and multiple options for progression, Disney clearly wanted a game that allowed players to define for themselves what kind of character Mickey Mouse would be. And in that the game succeeded spectacularly. Set in “Wasteland”, a world that is sort of a “mirror universe” of Disneyland, Mickey is tossed into a world populated by old Disney cartoon characters that he does not even remember, but they remember him. Some appear to like Mickey, but others are jealous of him and his popularity; chief among them is Oswald, Walt Disney's first creation who was replaced by Mickey. Complicating matters is the fact that Wasteland is so named not because it is a miserable place (the name is simply a play on Disneyland only for characters that were “wasted”), but because Mickey himself inadvertently unleashed a terrible destruction upon the land through his own carelessness. And this is where what we will call the “choice” system comes into play. 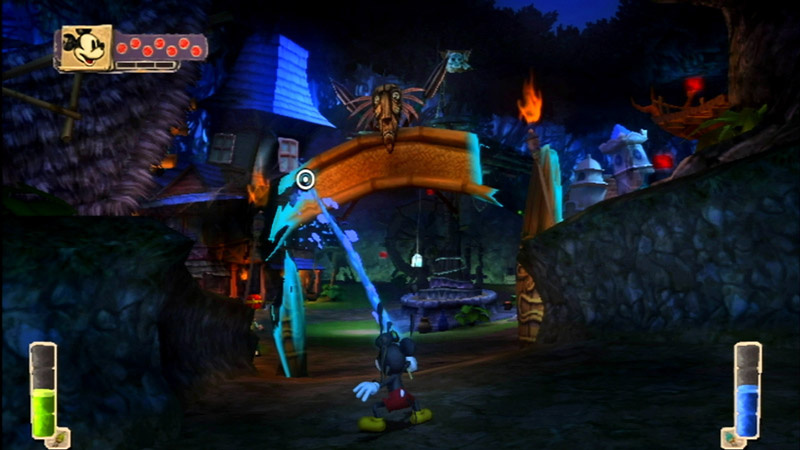 In almost every task that Mickey faces there are at least two options to choose from, but where other modern games give choices such as “good” or “evil”, the choices presented to Mickey are usually more along the lines of “A” or “B”. Often, there is no clear choice between right and wrong, merely one way or the other. 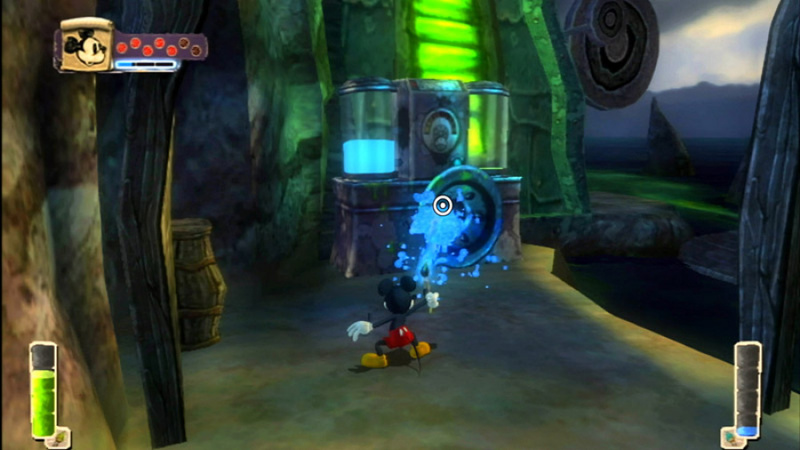 Early in the game Mickey is presented with an option to save a Wasteland inhabitant or allow him to die so as to obtain access to a treasure chest. This is by far and away the most clearly delineated choice Mickey will be faced with throughout the game, but it sets the stage for what is to come in the sense that there is no one “right” option: both choices work. Either one will get you through the game, but the choice you make will still have ramifications later. Even mundane occurrences such as fighting a generic enemy presents a choice: do you kill him, or befriend him? The world of Wasteland is a cartoon world, and Mickey comes equipped with the ultimate weapons in a cartoon world, paint in one arm and thinner in the other with a generously regenerating supply of each. He can either shoot an enemy with paint using the B button to befriend him, or he can shoot the thinner with the Z button to kill him. There is no right choice and it's up to you, the player, to decide how you want to get through each level. Some choices are easier, some are harder; some allow you to take one path, other choices lead you down another path. The way the game plays out is a consequence of the choices the player makes. 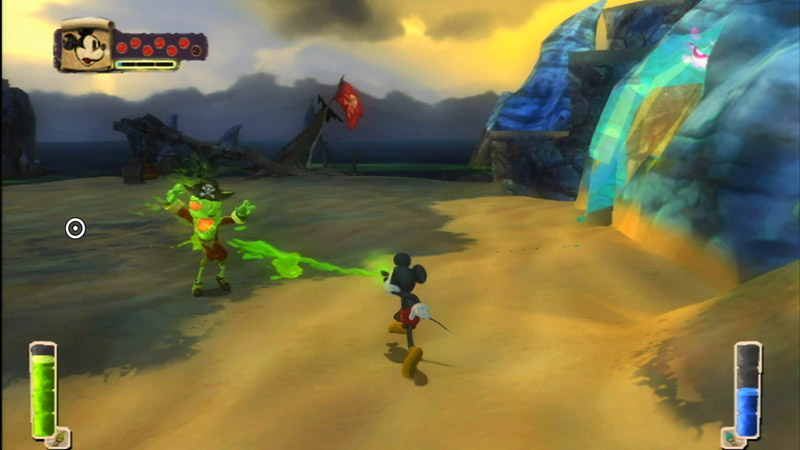 When fighting a boss battle, Mickey similarly has a choice between using paint or thinner to fight the boss. The choice he makes will require a different strategy, and one might prove to be harder than the other, but neither is necessarily correct as the choice he makes will influence later events in the game, as well as the ending. As Mickey makes these choices, he'll experience changes in the story ranging from predictable – such as receiving rewards – to radical, including skipping entire boss fights. In some cases, befriending one character will cause a related boss to show up at the appointed time at the end of a level only to tell you that since you are friends with his friend, he likes you as well gives you a gift rather than a fight. As amusing as an experience like this is, it proves to be only the beginning of the repercussions that will be felt throughout the game. For every step he takes, Mickey is making a choice and these choices have consequences. Just witnessing how the actions you take influence this world and the characters in it is a rewarding experience in its own right, and for good measure the game features an intelligent auto-saving checkpoint system that both generously saves your game frequently and also prevents you from ever taking back something you've done. With great power comes great responsibility, and although Mickey exerts extraordinary power over the world he is in, this is balanced by the fact that the choices he makes are set in stone. When Mickey makes a choice, he has to live with it, for better or worse. The paint and thinner are introduced early in the game and do not change throughout, although your supply can be increased. This makes Mickey's tools somewhat limited, compared to platforming games or Zelda-style games that feature many items to use. But ironically his power may be somewhat greater with just these two tools as there is always a variety of options for getting through a level and never just one forced path with one specific item. With thinner, Mickey can literally dissolve most obstacles and look for items hidden within; with paint, Mickey can create stairwells, platforms, and other useful objects (assuming the outline of them is there to begin with). The creative ways in which he can interact with his surroundings never seem to get old, and because the paths he chooses to take through a level are myriad, players who discuss the game afterward may discover that their solution to a particular puzzle was only one among many. An exception to this rule of choice seems to be the 2D platforming levels, used as segues linking one 3D level with the next. Mickey “travels” to the next level by traveling through an old cartoon, and these levels are gorgeous to look at because they are designed to look like an actual cartoon. They are, unfortunately, quite short and usually very straightforward; unlike the options presented in the 3D world, here the only option is to find the exit, and perhaps find an extra item hidden along the way. The controls for these levels also feel a bit sluggish, but are still easy to get through because Mickey has hit points that are generously replenished. The only thing stopping you from breezing through these levels is the occasional puzzle that is fun, but never overly challenging. Overall, these 2D levels left us salivating for a deeper experience in classic cartoon-themed stages of which Disney Epic Mickey simply offered too little. The short 2D levels is a problem of not enough of a good thing, but a more serious problem with Disney Epic Mickey is the lack of something that should be standard these days — an intelligent camera. The game's 3D levels borrow the play style of a classic N64 platformer. 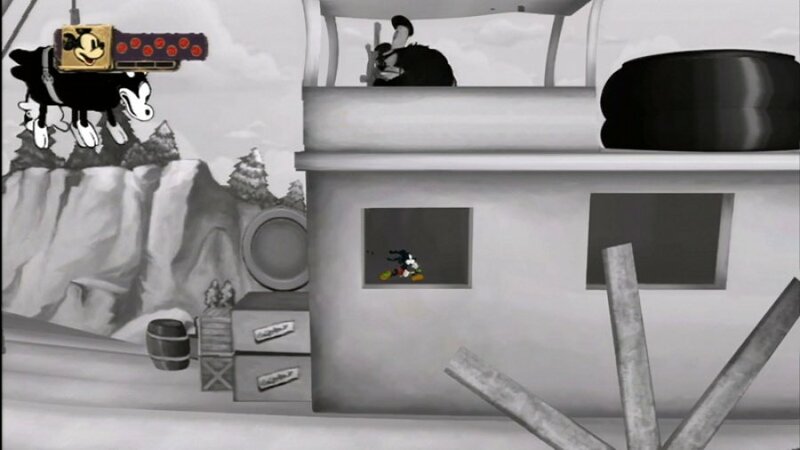 Unfortunately, it would seem that Disney borrowed the camera from those games as well as it generally does not work at all except with constant babysitting from the player. Because there is no dual analogue control with the Wii Remote, players are reduced to slowly moving the camera left and right with the D-Pad, a very clumsy system and not required at all in many modern Wii platformers such as Super Mario Galaxy. It's not that the camera system is poorly implemented, it's that it is almost completely incompetently designed and stands in stark contrast to the sophistication shown everywhere else. In some cases the camera takes over to where the player cannot move the camera at all. This is fine, unless you've jumped from one platform to another and after choosing to go another way as the game encourages you to do, you try to go back the way you came only to discover that you cannot move the camera to see the ledge you jumped from. Worse, sometimes when you are up against a wall or in a corner the camera simply cannot be moved behind you. Although Mickey has a first person view that can be called up by pressing the 1 button at any time, it is never available during these moments when the camera does not work properly. These situations do not arise from trying to go outside of the playable area or otherwise break the game, happening in areas that you are supposed to go to, and without actually trying. 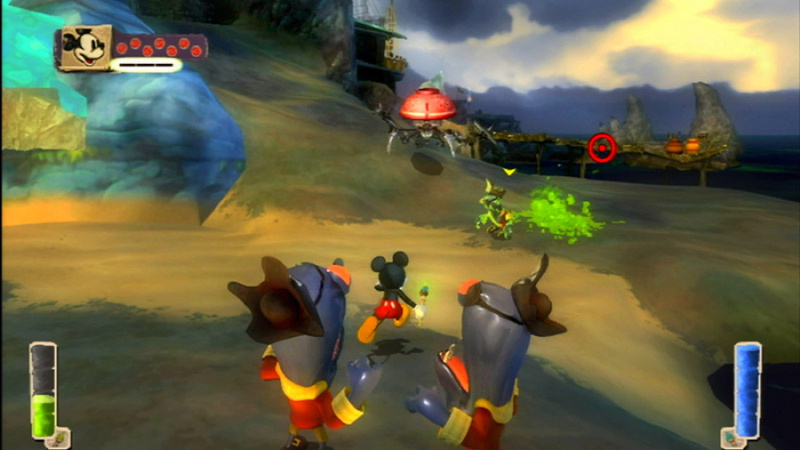 Furthermore, the glitchy camera may also be to blame for occasional situations where the player is clearly pointing their cross-hairs at a target on-screen and shoots only to have their paint splash impotently on the ground at Mickey's feet, although this may instead be a consequence of Mickey's aim not properly taking into account 3D features such as upward sloping hills. Although the game features an auto lock-on system to help you quickly find enemies when in combat, it is of limited usefulness. Pressing the C button will centre your focus on the next enemy in need of your attention. Doing so will help avoid having to move the camera as much, however it does not work as smoothly as a true lock-on system as seen in Zelda games. But where the gameplay has some out-of-date features to it, the graphics are clearly a modern Wii presentation. The opening and closing cutscenes are gorgeous and the game engine itself presents one of the best-looking games on the Wii. As the story takes place in a dark world, the animations were drawn to match that mood and, sadly, this means the entire presentation usually looks, well, dark. Set next to a bright and colourful game like Super Mario Galaxy, Epic Mickey does not compare favourably, but we suspect this is only because of the drab, muted colour palette used. 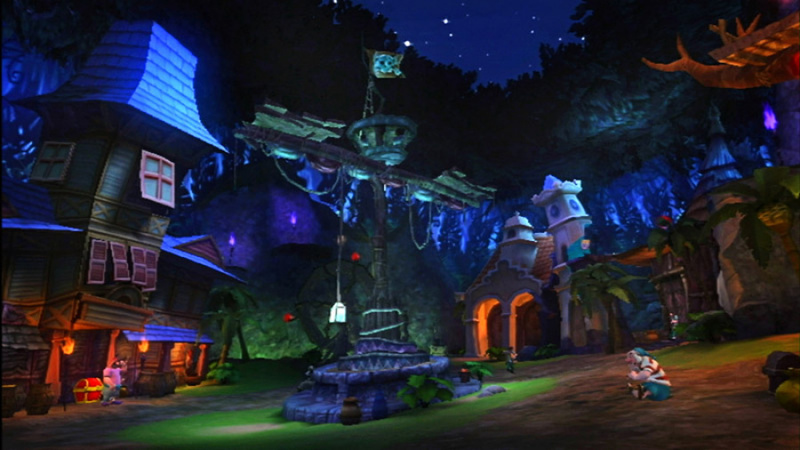 In a Wizard of Oz-like effect, some areas of the game such as Mean Street and OsTown allow Mickey to paint in colour turning these drab, depressing areas into bright and beautiful locations worthy of a Disney movie and consequently make the game look better as well. Augmenting the Disney theme is recognisable Disney music, appropriate to each level. Not only will you enjoy music appropriate to the area of Wasteland you are in, you'll even be treated to the historically accurate music from each cartoon featured in the 2D levels as well. Much of this music is public domain classical music, but it sounds good nonetheless. It's only a shame that none of the more recognisable Disney properties are featured in the game as the music from the movies is more commonly recognisable than the music from 80-year old cartoon episodes. It's also worth mentioning that, with the exception of the opening and closing cut-scenes, there is no voice acting at all and dialogue is text only. One of the neatest features of Epic Mickey is that, as you collect movie reels in the 2D levels, you can unlock cartoons to watch in the Extras menu straight from the title screen. Sadly, there are only two, and like the 2D levels themselves this is something we wish had been emphasised a bit more. Still, it's a nice reward to playing through the game and finding all of the hidden movie reels. After you have played the game through to the end, replaying is not only a choice you can make, it's a necessity. Because you were presented with so many options throughout the game, you will almost certainly be full of questions as to what would have happened had you taken the harder path, or used paint on a certain boss versus thinner, and so forth. The game can be breezed through pretty quickly, perhaps in less than 20 hours if the player always chooses the most expedient options. At the end you'll be left with only questions as to how the game would have played out had you opted for the more difficult solutions to the various puzzles. Playing through a second time and doing things differently will produce different results, and an all new rewarding experience as you try to figure out less obvious solutions to each puzzle and reap the rewards of different consequences to those actions, right up to influencing the final cut-scene. 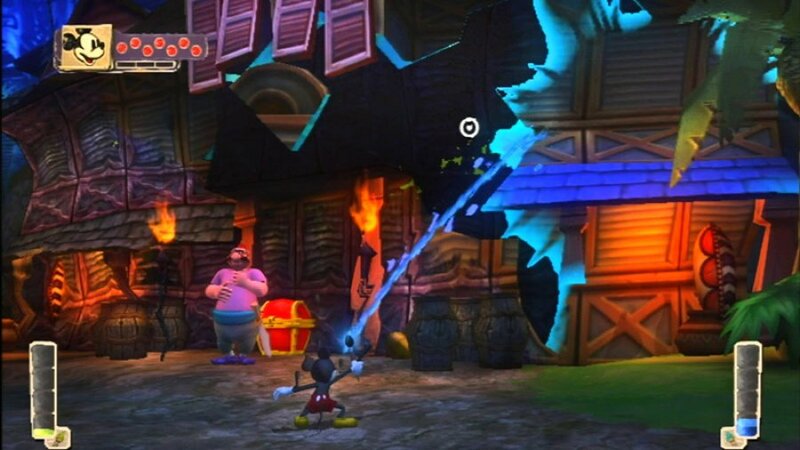 Epic Mickey promised a big story set in the Disney universe that offered players a wide range of choices and rewarding game play and for the most part, the game delivered on every one of those promises. If not for the clumsy camera it would be a timeless classic, but with the camera Epic Mickey can be dated at approximately 1997. Although clearly enjoyable even with this problem, the result is something significantly less than perfection. But more importantly, Epic Mickey is a very original game that defies easy classification. Usually, players struggle to “beat” or otherwise “complete” a game, but Epic Mickey makes that impossible. Instead, players are forced to choose, and because of this Mickey turns into a character more real than one forced down a particular path could ever be. Do want! But Sonic Colors comes first when I decide to buy a game with Christmas money. There's more wrong with this game that just the camera. Nothing about it is technically "broken" per say but the game was just totally uninspired and dull based on the hour or so I could be bothered playing it, and the constant hand-holding and explanations for virtually every single thing I was about to do just got extremely tiresome and annoying. The camera was one of it's biggest problems but far from it's only one. 3D platform games have come a long way since we first played the likes of Mario 64 but this games feels like it could have come out even before that game imo. I'd probably give it a 6 out of 10 personally, but I can live with a 7. I think I am getting this game for Christmas. A bad camera is not gonna scare me into not getting this game. Sounds like a fair score. This is a good game, and it dose live up to its name. Sounds like I should wait for the price to come down. I wanted this too much to never get it, though. @Kirk: It requires approximately 2-3 hours before you 'get' what it's about. I started to feel bored too with all the boats but it improves drastically. Same with MonsterHunterTri: you had to spend 4-5 hours playing offline to get familiar with stuff. Then the constant gathering/grinding starts to feel tedious. Then you jump online for 2 hours and it becomes the best co-op game ever made. Sounds right there with Fragile Dreams: I'll get it when it's cheap, but that's it.
" the game was just totally uninspired and dull based on the hour or so I could be bothered playing it, and the constant hand-holding and explanations for virtually every single thing I was about to do just got extremely tiresome and annoying"
You should really get Fragile, it's amazing. Camera problems are a game-killer for me (cough Mega Man 64). I refuse to shell out retail price for the fruits of lazy programming, or perhaps, a product that was rushed to the shelves. I'll save my cash for DKC returns, Kirby's Epic Yarn and Sonic Colours. I'm not going to say that this game was a big disappointment to me because i wasn't expecting it to be a masterpiece to begin with. I fail to see what is so amazing about this game and after playing it everything seems to be worse than i expected. Wow, its been a while since I've heard about such a big/good title getting ruined by a bad camera. It feels like last gen...or maybe evgen the genration before. I enjoyed it immensely. 7 is a fair opinion, but I'd give it an 8 personally. Before release, "Sonic Colours" lost out to this in E3, but, "Colours" is better than this game. Don't believe me? Read the reviews! Bad camera? Oh dear, that's a game breaker for me. But I wasn't going to get it anyways, so no biggy. I'll just wait for KEY and TLoZ:SS. I picked up my CE on Sunday. The extras are worth the $20 over the price of the game itself. As for the game, I really, really like it. Sure the camera can do it's thing here and there but then again it's a problem we've been having to deal with going all the way back to the N64 so, what's the big deal? I think its better than Fragile Dreams, though I see why folks would make the connection. I think its a great game overall and reminds me of playing stuff like castle of illusion as much as say, Rayman 2. I never found the camera to be overly troublesome myself--certainly not to the point where it harmed the experience. My main complaint was that the pacing was thrown off by pointless fetch quests every now and again. However, I enjoyed it so much that I immediately dove into a second playthrough, which is even more intriguing than the first. I was expecting a higher score but a 7 is alright. I'm sure I'll be getting this sometime in the future. 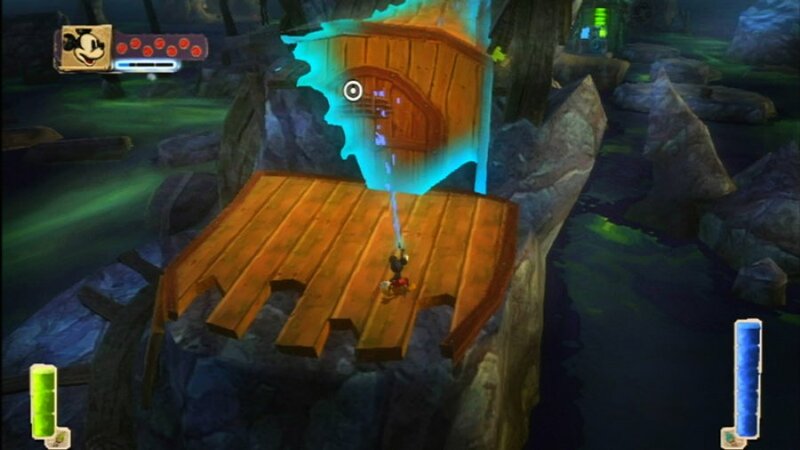 7, 8 or 10, Epic Mickey is a great, unique and enjoyable game. Very deep review, Spencer McIlvaine; congratulations. 7 is a good score! This is one I'm wanting for Christmas! This might be a good game but I just got too annoyed wrestling the camera to find out. Shame, really. It a pity about the camera issues. These types of issues are usually deal breakers for me. This was second on my to buy list, right after DKCR, but it has moved from a must buy to a maybe. Maybe I'll change my mind once I've rented Mickey, but for some reason I doubt it. Might just pick up Goldeneye or Sonic instead of this. Great review by the way. I have to say I would've given it an 8. I enjoyed it more than Sonic Colors (although both are pretty great). My only real problem with this game was solved in the forums, where I learned about the lock-on feature. I really hope disney starts offering more like this in the future (With shorter tutorials though!). Big discussion thread on the forums about this. I eventually bought it and, despite its niggly flaws, it is a very good game. 8.5/10 for me. Its a long game and a deep one. Persist with it and enjoy. Unique game. Thanks for the informative review, McIlvaine. It actually made me more interested in playing the game. Despite the camera problems, I place great value in originality and thus I think I will enjoy this game more than you did. For what it's worth, the camera in The Crystal Bearers was worse. The camera situation is unfortunate but it's something I think most of the people posting here shouldn't be overly concerned with as they are already willing to put up with the same thing in their retro library. But for the sake of the general Wii audience, the score has to take into account the vast majority of non-retro gamers out there. For young people who's first gaming experience is with the Wii, or older folks coming back into gaming after skipping the past decade or two, these issues will be unfamiliar and intimidating and in many cases will affect their appreciation of the finer aspects of this game. Those people should be warned to take note of this issue before making a purchase, and that's what a 7 does under our scoring policy. But if you're familiar with the N64 and you're okay with the 'retro' camera controls from back then then you shouldn't hesitate to pick this one up. I think it compares favorably to the best games of that era and I really enjoyed it quite a lot. I love the concept and story, but I hate morality systems. I just want the game to decide what I need to do, or at least significantly limit the choices available. I don't want to have to make choices at every little part of the game to decide what will happen afterwards, and I especially don't want to have to decide how I must fight every group of enemies to keep my morality in check. That's why I'm not getting this game. The worst Wii game camera I've ever encountered is in "The Simpson's Game." That camera has absolutely no automatic movement at all. Every camera movement has to be manual, and you can't move it behind you if there isn't "room" for the camera there. When combined with the game's heavy platforming, it was extremely frustrating and annoying. How does the camera in Epic Mickey compare with that? The day you give this game lower than 7/10.... is the day the world goes mad. I'm a BIG Virtual Console gamer (2 reasons, one is because I'm very late to the gamer wagon so I want to experience the classics before moving on to modern games, and two is because I can't afford most retail games), so I don't think I'll mind the camera too much. Personally I think Epic Mickey is much better than a 7, especially compared to some of the games that Nintendolife throws 9's at (Ivy the Kiwi better than Mickey really??). The camera is a little awkward but no more so than in any other open world type game, although if you are not an experienced gamer then you may have trouble with it. I actually think that if it had a perfect camera then it would be a much easier game (the camera is sometimes half of the puzzle), but if you have played a 3D type game before then it shouldnt really be a problem. This is a unique type of game as it goes against the usual 'gameplay over everything else' approach and instead focuses more on story and atmosphere. For some games this is a problem (looking at you FFXIII), but it isn't for EM as everything seems to blend into an engaging experience. This isn't my favorite Wii game of 2010 but it would be high up in the top 10 (which is an achievement given the amount of great games this year) and the biggest compliment that I can give it is that I didnt even really like Mickey Mouse before this game; but now I am quite fond of the little rodent. In that respect I think that Junction Point has done a fantastic job. @38. Bulbasaurus Rex: I personally think it's better. At least in Epic Mickey when there's some platform-y bits with linear paths, the camera will pick a fixed angle, á la Super Mario Galaxy. The free-roaming areas can sometimes be awkward, but if you've played N64-era adventure and platforming games, you'll definitely be able tolerate it. "For what it's worth, the camera in The Crystal Bearers was worse." Worst game I ever played, so this had better be better. This will be under the Christmas tree and I have to say my enthusiasm has gone. So many CE's sitting on store shelves and a $12 trade-in value on Amazon makes me think this won't be so great. Had LBP2 come ou tIprobably would've just rented this but oh well. Only bright side - first play through will be all paint, second all thinner (or some such) so I do have that to look forward too. I really shouldn't ask for games this Christmas, but instead a game rental service gift card, & some money, so I can try games, & purchase the ones I enjoy. Edit: Goldeneye, Galaxy 2, Other M, this game, past titles I still don't own, like Mario Kart Wii, etc. A lot of games, that I need to weed out my favs. Edit 2: Excellent review, Spencer McIlvaine, & NLife! As always, of course. Oh I'm not saying the camera in Crystal Bearers was its only problem, but it was a big one. It almost never gave me a comfortable viewing angle and I constantly had to adjust it using the directional pad which was also uncomfortable because it seemed to take ages to move. By contrast, Epic Mickey's sensitivity when it comes to directional pad adjustments feels just right. It's just the auto camera chooses (or forces) bad angles sometimes. Apart from the directional pad movement being quite smooth, you can tap 'c' to quickly set the camera behind Mickey a la Zelda games. And tapping '1' puts you into first-person view for a better look at your environment. Wow.... I am not even a huge fan of this game and give it higher than a 7. I think this is the first time I have seen a Wii game get a lower score on here than G4 or IGN. It's nice that you cleared that up. I really like Epic Mickey but it does have a good amount of almost fun destroying flaws. If you were to strip away all the extraneous stuff you'd have a typical, perhaps generic platformer. The fact is though it DOES have all that extra stuff and that's what makes it special. The secrets that come from exploration and the theme of forgotten characters really sold me as well. I agree with your points, though I would give it an 8/10. Still one of the better Wii games of the year. I love the concept behind the Epic Mickey but I have to agree that there are some technical flaws. old disney movies as extra contect (currently unlocked 2, hope there are more). This seems like a love it/hate it game. Either you will fall in love with it for the Disney theme and paint thinner mechanic, or you are going to hate it for the camera issues and fetch quests. Well, I'd rather download VC DK3, which I've never finished, than buy Returns, because this particular site gives it a 10. At the very least I'll be having a vintage Rare game then, instead of a limited '3d but really 2d for ol' times sake' Gamecube-ish mess. I hate expansive in-game tutorials, but if it feels anything like Castle of Illusion with a tad of Banjo Kazooie, I'm getting it. I played this at Wal-Mart and the camera controls really weren't that bad. I didn't find a single problem with them, actually. Well of course, if you grease up and spit polish the controller that can only help. This. is. the. best. Wii. game. ever. @Nintenzo I didn't have any problem with the camera either. I actually didn't have any problems except that I couldn't see because it was too dark but it added to the thrill for me because it reminded me that I was in a ruined dark world. I adapted to the darkness and mastered traveling through Wasteland no matter how dark the world was. I could beat the game with my eyes closed even. Also, just the thought of a dark Disney game seems impossible. When I heard of it I thought, "Disney couldn't make anything dark even if it hit them in the face." I thought it was gonna be Kiddie Mickey rather than Epic Mickey. I HONESTLY expected Mickey Mouse's Clubhouse to appear somewhere in the game. BOY, was I wrong. It is truly dark and epic and well done. Easily the best Wii game ever. Should be number one on the top 50 Wii games list.